WILLEMSTAD - The University of Curaçao has 30 percent fewer applicants this year compared to last year. This is according to Francis de Lanoy at the opening of the academic year. 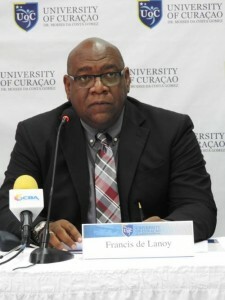 According to the Rector Magnificus, it is absurd that the government pays for students to continue their education abroad in studies that are offered here on the island. Instead, the government should have a better policy in which it only pays for those students who will continue their education in studies that are not offered at the university on the island. Due to the decline in applications, some of these majors are in jeopardy. The university is now looking for funds to continue some of these studies.